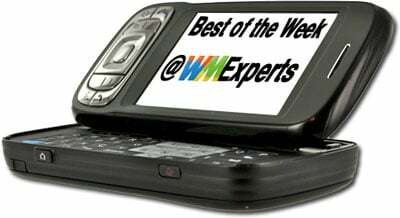 Much of this week at WMExperts has been devoted to pounding the drumbeat leading up to CTIA 2008. We told you that we're expecting Windows Mobile 6.1, showed you about a third of the gear we're packing, and pimped our brand new Twitter feed and Flickr too. Then we had to turn that hyperventilation into a holding of breath as we took the very organization hosting this fine event behind the woodshed for their support for crappy wireless corporate practices. Maybe that article will cause Steve Largent will pull us out the registration line just like an Evolutionist at an Intelligent Design Movie Premier. You never know. Speaking of people messing up wireless, Motorola decided that it would be a good idea to split in two someday, the press release said all but “We are synergetically realigning the chairs on the Titanic as it merges into this iceberg.” We also grabbed a firmer date of the Treo 800w's purported release, a firmer idea of what the 800w's connector would be, and of course nattered about all of the above for nearly an hour and a half in the WMExperts podcast. Reviews? We had them too: Blueant Supertooth Light Bluetooth Speakerphone, Monaco Rubber Trim Case for Cingular 3125, and Facade Today Screen Customizer. All that great stuff almost makes us this excited. Almost.